With the Android powered BlackBerry Priv raising up quite a storm in the world of smartphones, it could be that Google and BlackBerry are fast becoming bosom buddies. In fact, the two are teaming up to conduct a webinar on October 15th, this coming Thursday. The event starts at 11am EDT. Hosting the event for the BlackBerry side will be David Arnold, Senior Enterprise Solutions Manager for BlackBerry Enterprise. Google will call on Michael Wyatt to handle the Android portion of the event. Wyatt runs Chrome and Android at Google for the EMEA (Europe, Middle East and Africa) market. The webinar will run for approximately 45 minutes, and will show businesses how using BlackBerry's BES12 EMM together with Android for Work, can reduce security risk, improve productivity, and lower costs. BES12 supports BlackBerry, iOS, Android and Windows Phone. If you're interested in registering for the event, click on the sourcelink. "Android is the world's most popular mobile platform, with an 85% share of the market. It's no surprise then that Android is also the target for 98% of all mobile malware. User adoption and security threats are both considerations that IT administrators and business leaders need to address. 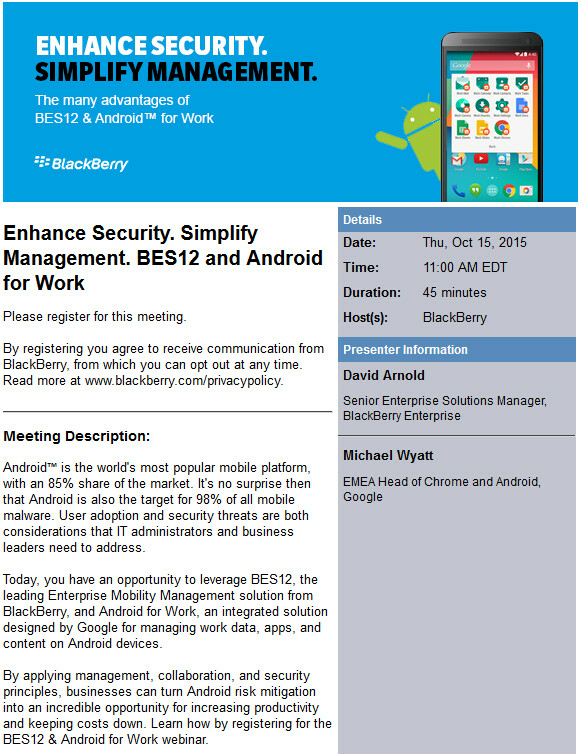 Today, you have an opportunity to leverage BES12, the leading Enterprise Mobility Management solution from BlackBerry, and Android for Work, an integrated solution designed by Google for managing work data, apps, and content on Android devices. Google will be holding its own Android for Work webinar on November 4th from 2pm to 3pm EST. You can register for that event by clicking on this link. O snap. Now get dual window into AOSP correctly Google overlord. I think we are seeing the beginnings of a mutually fruitful relationship between BlackBerry and Google. Both can definitely benefit from what each brings to the table. Well I can already tell it'll be almost impossible to root these devices, given blackberry's traditional protocols of security, definitely a challenge to the guys over at XDA. I bet root will come, though not without warranty killer. They can't even root Knox-equipped Samsungs how on Earth are they going to root a BlackBerry? Where's the custom recovery going to come from? Am looking forward to seeing this, mainly because while not exactly blackberry, a byproduct from Sammy's Knox phones weren't rootable. From what some reports are saying, BlackBerry is using as close to stock Android as possible on the Priv. Interesting. We need security after the whole Stagefright fiasco.